It’s beginning to look a lot like Christmas… if only inside my house. Normally there’s a foot of snow on the ground where I live, but nothing this year. But there have definitely been cold days and on those chilly days nothing sounds better than a nice warm bowl of soup. I love soup, but my husband is rather picky about soup so it takes awhile to find something he will willingly eat. His soups usually need to have some substance to them, or have a unique take. But I know his weakness: Mexican food. He loves it, even enough to try a Mexican food inspired soup. So this Green Enchilada Chicken Soup was perfect. He loved it so much we’ve made it multiple times now. If you’re tired of the same old soups (not that there’s anything wrong with the classics), this enchilada soup is warm, filling, comforting and delicious. In a large pot, combine the enchilada sauce, chicken broth, shredded chicken, green chilis and corn. Add the spices and bring to a boil, stirring occasionally. Reduce heat to a simmer and let the soup cook for about 20 minutes. 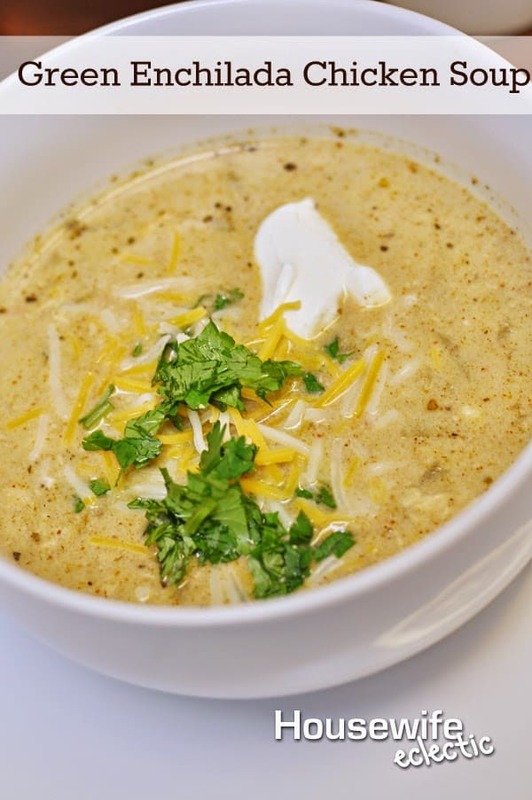 Stir in the sour cream until combined and soup becomes creamy. Serve with freshly chopped cilantro, shredded cheese, tortilla strips and sour cream. Seriously, this soup is about as easy as it comes. The hardest part is making sure you have the ingredients on hand, but if you stock up on the enchilada sauce and green chilis, this is a meal you can hammer out in hardly any time. That sounds really good. I love meals like this. That looks so good. I love that it is healthier. Wow this looks awesome! Ill have to add this to my meal plan next week. The spices you used are so deliciously flavoful. I'd love to try this soup. This looks and sounds so delicious. Green enchiladas are my absolute favorite. Your soup looks great! I have this bookmarked as the weather turns more chilly! This looks so good! I love that it's healthy too! Wow I have to admit I cringed when I first heard the name of this soup but the ingredients look awesome! This sound so good on a cold day, for sure. I love enchilada soup. This looks tasty!! Oh my goodness, that it is so up my alley and looks beyond delish! Just made this and mine is a deep red/brown!?! I confirmed I put in all the spices as noted…hmmm?? Did you make sure you used green enchilada sauce? If you used traditional red enchilada sauce the soup will be red and not green. Just finished making and eating this….holy amaze-balls was it delish! Great recipe! I too have a deep red / brown soup…perhaps the soup calls for 1 tsp chili powder and not 1 tbsp chili powder as prescribed? Wonder if I could use cream of chicken soup instead of sour cream, anyone know?